Visit Bicentennial Capitol Mall State Park and Stones River National Battlefield for their historical value. Get outdoors at Radnor Lake State Park and Stand-Up Paddleboarding. Explore Nashville's surroundings by going to Arrington Vineyards (in Arrington) and McGavock Confederate Cemetery (in Franklin). Next up on the itinerary: take an in-depth tour of Lotz House Museum, brush up on your knowledge of spirits at Nelson's Green Brier Distillery, take in the views from Cumberland River Pedestrian Bridge, and stop by Hatch Show Print. To see reviews, traveler tips, photos, and tourist information, go to the Nashville trip planner . Topeka to Nashville is an approximately 6-hour combination of shuttle and flight. You can also drive; or take a bus. June in Nashville sees daily highs of 88°F and lows of 67°F at night. Finish your sightseeing early on the 4th (Tue) to allow enough time to drive to Chattanooga. Kick off your visit on the 5th (Wed): partake in some friendly competition at Escape Experience - Chattanooga, witness the site of a historic battle at Point Park - Lookout Mountain Battlefields, then explore the fascinating underground world of Raccoon Mountain Caverns, and finally cast your line with a fishing tour. To see more things to do, traveler tips, other places to visit, and more tourist information, read our Chattanooga trip itinerary planner. Traveling by car from Nashville to Chattanooga takes 2.5 hours. Alternatively, you can take a bus. The time zone difference moving from Central Standard Time (CST) to Eastern Standard Time (EST) is 1 hour. In June, daytime highs in Chattanooga are 89°F, while nighttime lows are 68°F. Cap off your sightseeing on the 5th (Wed) early enough to go by car to Pigeon Forge. Discover out-of-the-way places like Grotto Falls Trail and Tuckaleechee Caverns. Get outdoors at Roaring Fork and Clingmans Dome. 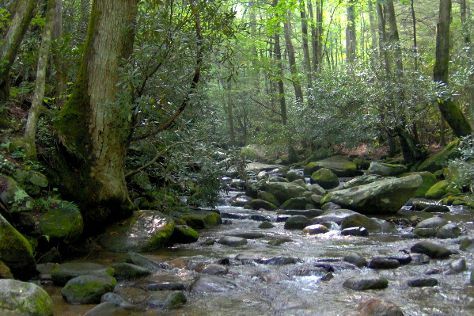 There's lots more to do: hike along Roaring Fork Motor Nature Trail, take in the dramatic natural features at Chimney Tops Trail, brush up on your knowledge of spirits at Sugarlands Distilling Company, and putt your heart out at Hillbilly Golf. To see other places to visit, where to stay, more things to do, and more tourist information, use the Pigeon Forge road trip planner . You can drive from Chattanooga to Pigeon Forge in 3 hours. In June in Pigeon Forge, expect temperatures between 86°F during the day and 66°F at night. Cap off your sightseeing on the 9th (Sun) early enough to travel back home.